After MR Jan Koum said about his resignation from the WhatsApp CEO post. New CEO searching is started. According to the leaks WhatsApp’s Business Executive Neeraj Arora is shortlisted candidates for the CEO post. it was decided when Brian and I started WhatsApp and it’s been an amazing journey with some of the best people. But it is time for me to move on. Chances to Neeraj for becoming CEO. Neeraj Arora is an IIT Delhi and ISB graduate who worked with Paytm and Google and you know who Paytm and Google is . Neeraj Arora has worked as the Corporate Development Manager at Google for three years. After that he was promoted to the senior member of the Corporate Development Team where he worked for a year. He was one of the Board of Directors at Vijay Shekhar Sharma-led PayTm. If Neeraj Arora’s name confirmed for the CEO post he would join the league of Indian-origin CEO’s of Satya Nadella and Sundar Pichai. 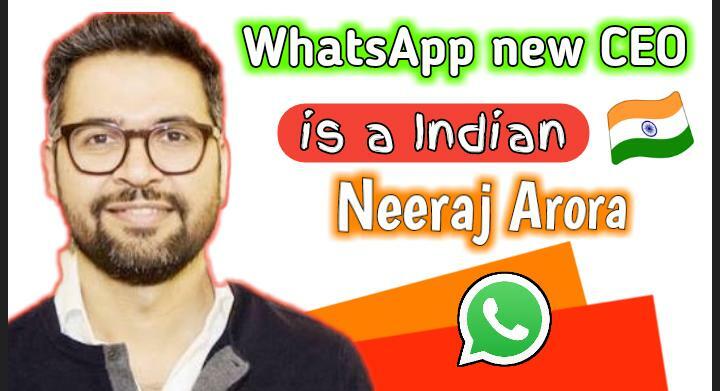 Neeraj Arora has joined the WhatsApp in 2011. Jan koum’s announced his resignation through a Facebook post. Jan: I will miss working so closely with you. I’m grateful for everything you’ve done to help connect the world and for everything you’ve taught me. Also about encryption and its ability to take power from centralized systems and put it back in people’s hands. Those values will always be at the heart of WhatsApp”. Jan, your work in building WhatsApp has connected so many people around the world. Jan Koum’s exit came at a time when Facebook is in the middle of data breach row.